By 37 BC, ancient Romans were already constructing with concrete that could set under water—today, material researchers believe it had properties superior to modern portland cement concretes.1 Roman formulations for cement and concrete production were used for nearly 2000 years before bricklayer Joseph Aspdin of Leeds, England, named and patented modern portland cement in 1824.2 Although modern production of cement is far more advanced, Aspin laid the foundation for the methods used today. Concrete production has advanced as a result of new technologies. The dry method is the most common way to manufacture modern portland cement and involves taking the necessary raw materials—predominantly quarried limestone and clay—and crushing them. Then, the crushed rock is combined with other ingredients such as ground and mixed fly ash, and fed to huge cylindrical steel rotary kilns lined with firebrick. These components are heated to nearly 1480 C (2700 F). Kilns are typically 3.65 m (12 ft in diameter) and often 122 m (400 ft) or longer in length. Clinker is discharged red-hot from the lower end and is then cooled to handling temperatures. To save fuel and increase burning efficiency, the heated air from the coolers is returned to the kilns. Clinker is discharged from the kiln as grey, marble-sized balls. Cement plants can then grind it and mix it with small amounts of gypsum and limestone. Quarrying, grinding, and kiln-firing to produce cement makes the material a relatively carbon-intensive component of concrete’s production. 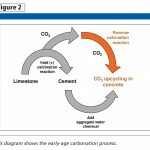 For example, production of one tonne of cement creates an estimated average of 650 kg (1430 lb) of carbon dioxide (CO2).3 However, concrete can also sequester carbon dioxide through weathering carbonation and early-age carbonation. These two aspects are explained later in this article. It is estimated early-age carbonation technologies have the potential to reduce carbon dioxide emissions by up to 32 million tonnes per year in North America by using carbon dioxide to cure concrete blocks, pavers, and segmented retaining walls.4 Now, innovative green concrete technology companies are employing this method for concrete production. Weathering carbonation occurs as concrete matures due to the reaction of carbon dioxide in the presence of moisture with the hydrants (i.e. alkalis) in concrete, mortar, and grout. Specifically, carbon dioxide from the atmosphere diffuses into the capillary pores and combines with the water to form carbonic acid.5 The rate of CO2 diffusion depends on relative humidity (RH); it is most rapid between 65 and 75 per cent ambient RH. Carbonic acid then reacts with the hydrants—such as solid calcium hydroxide, calcium silicate hydrate (C-S-H) gel, and alkali/calcium ions in pore solutions—to form carbonate. Generally, calcium hydroxide has the highest concentration in portland cement concretes and mortars. Mortar, being more porous than concrete, experiences higher rates of carbonation where the more porous the mortar, the more rapidly carbonation occurs. 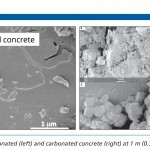 In dense concrete, for example, penetration may be less than 20 mm (0.78 in.) after 50 years, whereas with the mortar in the joints of masonry structures indicator tests have demonstrated carbonation of a 10 to 13-mm (0.4 to 0.5-in.) thick mortar joint is substantially complete after about a decade. This implies carbon dioxide from the atmosphere is absorbed by concrete over the concrete structure’s lifetime. In this way, concrete and masonry structures can be seen as passively ‘green’ as they sequester small amounts of carbon dioxide for extended periods of time. The second form is early-age carbonation, which involves employing carbon dioxide in the production of concrete wherein the reaction occurs at early ages of fresh concrete. The carbonation can take place as early as the concrete mixing stage and can end with the conclusion of accelerated curing. This form of carbonation is more easily controlled. Generally, the process of early-age carbonation introduces CO2 during concrete masonry unit (CMU) production to result in an immediate carbonation reaction that occurs simultaneously alongside the heat of hydration reaction of cement. CMUs are ideal products for carbon dioxide sequestration because they are relatively porous. One method introduces carbon dioxide during the curing phase of production, feeding CO2 into the typical cure chamber—a closed chamber under low- or high-pressure steam. A second method introduces carbon dioxide into production by injecting controlled doses of gaseous CO2 into the mixer feeding into a masonry unit production machine. 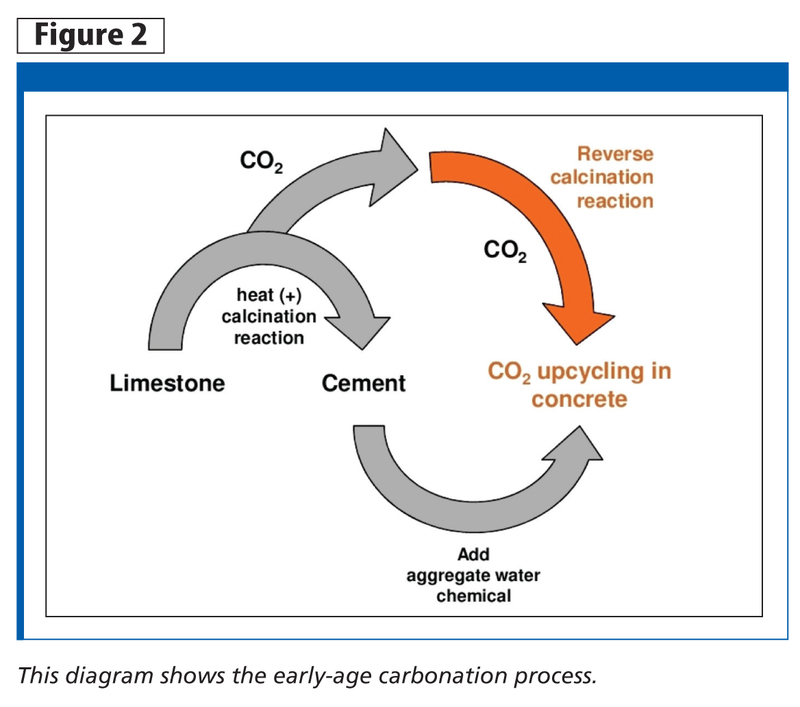 In both methods, carbon dioxide is permanently sequestered as solid limestone embedded within the concrete matrix (Figure 1). In the second method, concrete and carbon dioxide are intermixed while the mixing cycle proceeds. The mixer serves as a contained reaction vessel. The carbonated concrete is then discharged from the mixer and used in conventional masonry unit production process. The system is installed as a retrofit to existing production equipment where liquid carbon dioxide onsite supplies the gas delivery system for providing room temperature CO2 gas. The injection of the carbon dioxide is synchronized with the mixing cycle and is appropriately proportioned for a given mix design. The gas is commercial-grade carbon dioxide that has been captured from point-source suppliers. Figure 2 illustrates the process. 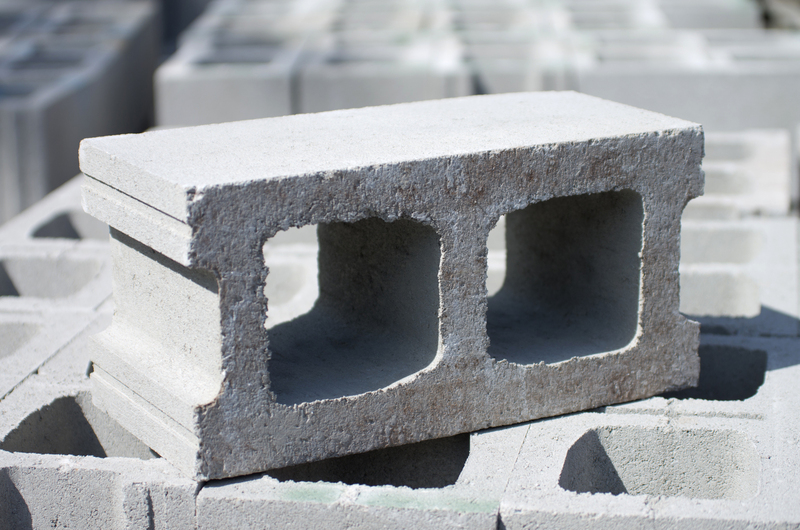 Carbonation curing is not only environmentally responsible, but when applied to the concrete block’s treatment, it can also reduce shrinkage, decrease defects in the finished block units, and reduce energy required to cure the concrete. The addition of CO2 into concrete production can also result in higher early strength of the concrete. These higher early-strength gains can allow for producers to reduce their cement loading, and thus further reduce their CO2 footprint. Concrete products made with this technology can contribute to Leadership in Energy and Environmental Design (LEED) credits under the Innovation in Design (ID) category of the 2009 version. Under the recently released LEED v4, the carbon footprint reduction may contribute toward the building lifecycle impact reporting credit under the Materials and Resources (MR) category. 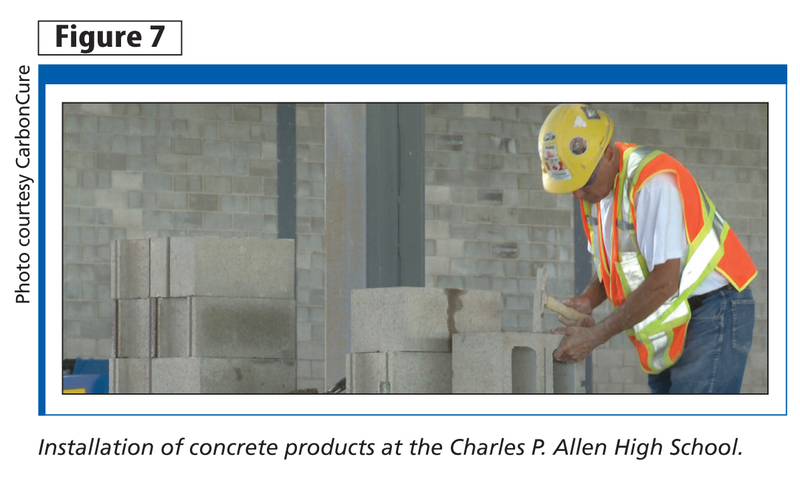 Additionally, some manufacturers are developing Environmental Product Declarations (EPDs), which disclose a product’s environmental impacts, and Health Product Declarations (HPDs) for concrete products list health impacts. 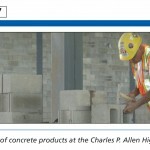 Projects employing concrete products using these technologies can be found across North America. 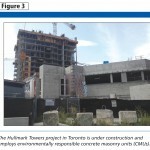 For example, Tridel’s Hullmark Centre in Toronto is taking advantage of these carbon-cured CMUs. 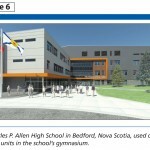 Designed by Kirkor Architects and Planners, the project is expected to be completed this fall (Figure 3). The building is located above two subway lines and has become an integrated commercial and residential project. Designers have created a modern mixed-use project, with glazed architecturally dynamic forms. It is targeting LEED Silver certification by employing green technologies including the use of sequestered carbon dioxide concrete blocks in the parking garage. 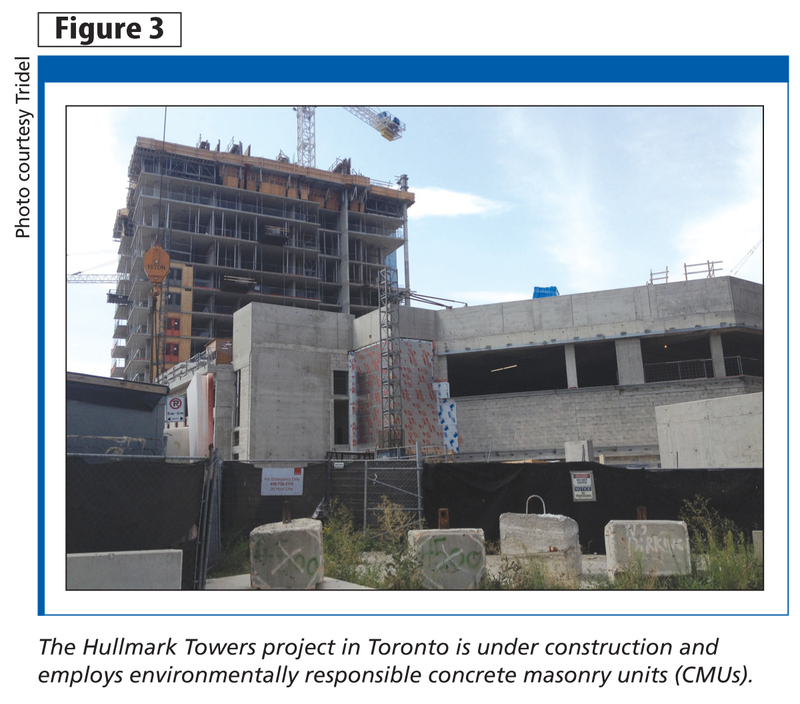 Hullmark Centre is expected to house 685 residential units and approximately 90,000 m2 (970,000 sf) of usable space within its podium and two towers. Though out of sight, the use of the green concrete products may contribute to the building’s LEED certification. 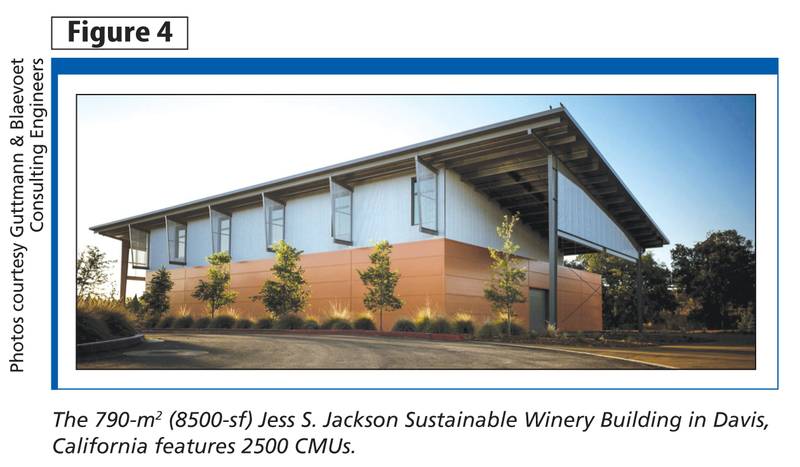 Another recent project that employed the concrete technology in its construction is the Jess S. Jackson Sustainable Winery Building located in Davis, California (Figure 4). 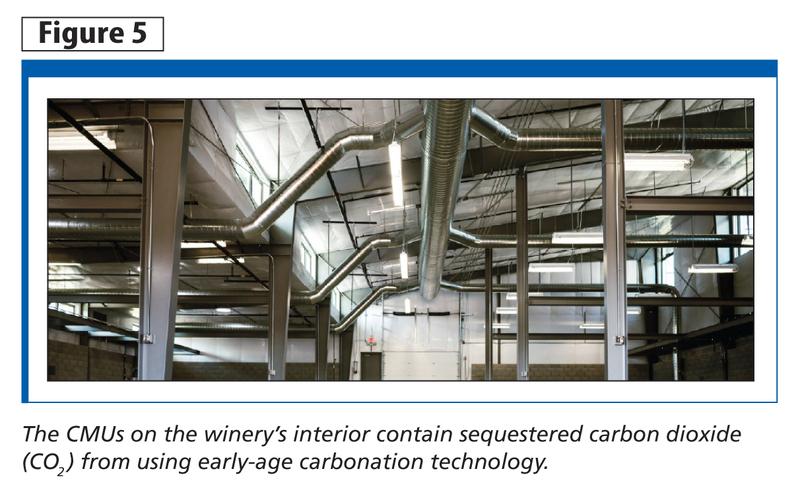 The 790-m2 (8500-sf) building used 2500 concrete blocks that contain sequestered CO2 using early-age carbonation technology (Figure 5). 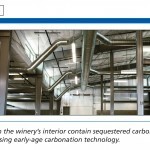 The carbon sequestration achieved through the use of concrete blocks, in conjunction with numerous other green technologies—such as floor slab containing a heat exchanging tube system and high R-value walls and roof—made this the first winery in the world to be awarded a LEED Platinum certification. 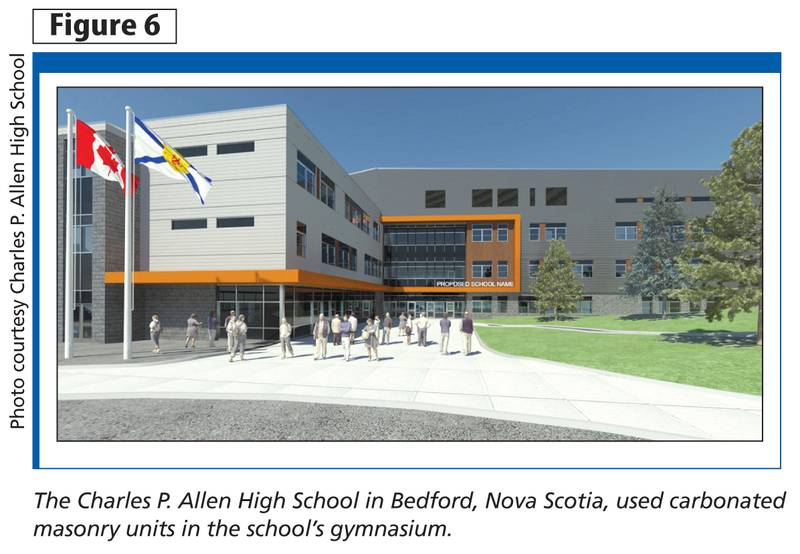 The newly constructed, 17,000-m2 (183,000-sf) Charles P. Allen High School in Bedford, Nova Scotia (see Figure 6,) also used concrete blocks to reduce its environmental impact and carbon footprint. 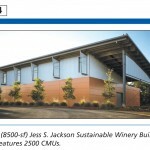 The design architect, Architecture49, recognized the carbon-cured block had less embodied energy and provided greater strength than conventional CMUs. Portland cement has been in use for approximately 190 years, while concrete has been employed for more than two millennia. Modern technology has emerged that can reduce the environmental impacts associated with this ancient construction material. Although carbon dioxide sequestration of concrete occurs passively over time by the absorption and storage of carbon dioxide during weathering carbonation, carbonation curing of concrete is an active method to further reduce the carbon footprint, while providing material performance benefits. adhered concrete masonry veneer products. lower defects in the finished block units. Although this method is only one method of using carbon dioxide to cure concrete products, its related technologies will ensure concrete and concrete masonry will continue to be recognized for their long life, and now also for their green and sustainable attributes. The carbon-sequestering adds minimal cost to the manufacturer as the producer incurs the cost of purchasing CO2 from local smokestacks, as well as the technology itself. Due to the performance benefits and appeal of greener materials, the additional cost to building owners is negligible. The sequestering technology tackles one piece of concrete’s carbon footprint puzzle and provides positive incremental impacts. With further innovations to incorporate carbon dioxide into concrete, it is possible to imagine a future where concrete becomes a carbon-neutral material, thus allowing the material to be recognized for not only its longevity, but also its sustainable attributes. Jennifer Wagner, MSc. 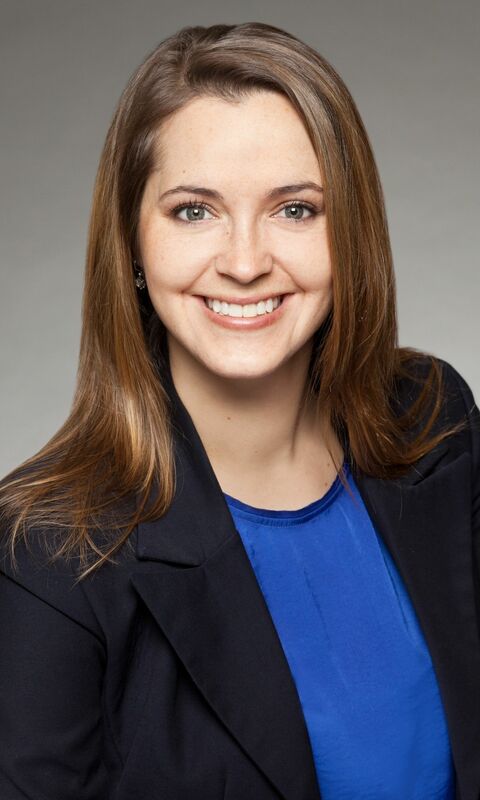 MBA, is the vice-president of marketing at CarbonCure Technologies, a Halifax-based clean technology company. She holds a BSc from McGill University, an MSc in chemistry, and an MBA in Finance and Sustainability from Dalhousie University. Wagner is a CSA-certified greenhouse gas inventory quantifier, LEED Green Associate, and sits on the board of the Atlantic Chapter of the Canada Green Building Council (CaGBC). 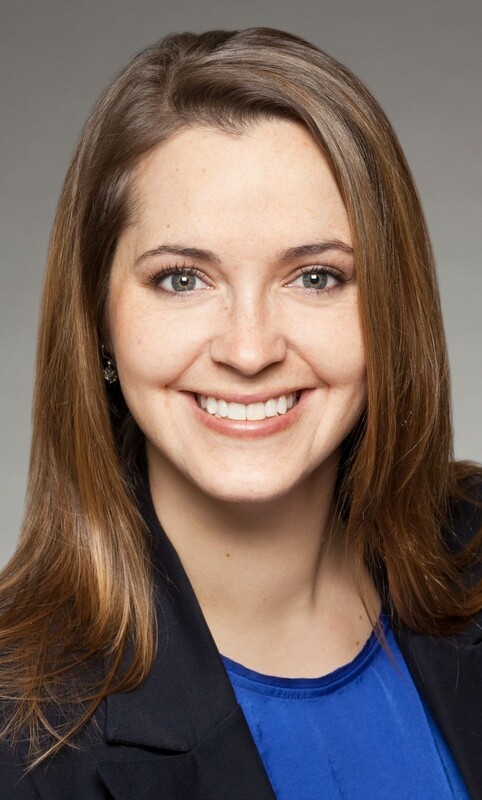 She is also an active participant in sustainability committees for the National Ready-Mixed Concrete Association and National Concrete Masonry Association. Wagner can be contacted by e-mail at jwagner@carboncure.com. 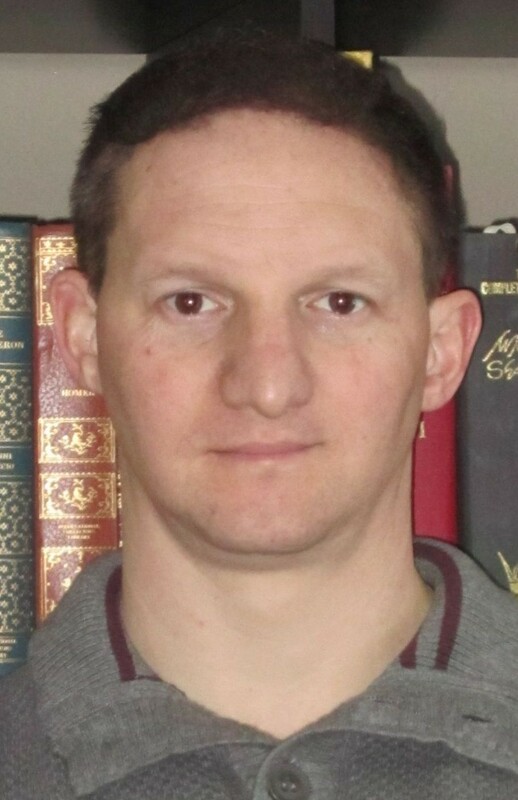 Mark D. Hagel, PhD, P.Eng., is the executive director of the Alberta Masonry Council. He holds bachelor’s degrees in actuarial science/applied mathematics and civil engineering, and a doctorate in civil engineering. 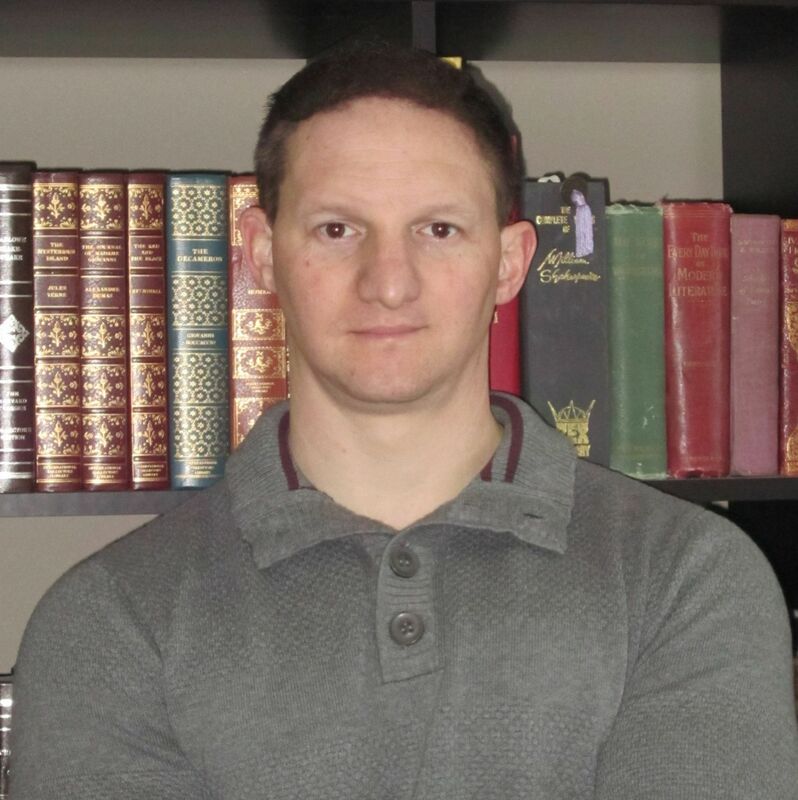 Hagel was previously employed as a technical services engineer for the Canadian Concrete Masonry Producers Association (CCMPA) and a building envelope engineer and structural engineer with the Calgary office of Halcrow Yolles. Hagel can be reached via e-mail at markhagel@albertamasonrycouncil.ca.